Byrne Sends Message To Morris - I’ve Never Lost A Title Fight, I’m Not Starting Now! On Saturday, 27th April at York Hall in Bethnal Green, London, former Australian Light Welterweight Champion, Dean ‘Irish Lightning’ Byrne, is set to challenge for his first domestic title, when he faces Jay ‘IOW Assassin’ Morris for the vacant International Masters Welterweight crown on the Dave Murphy promoted ‘Thunder & Lightning’ event. 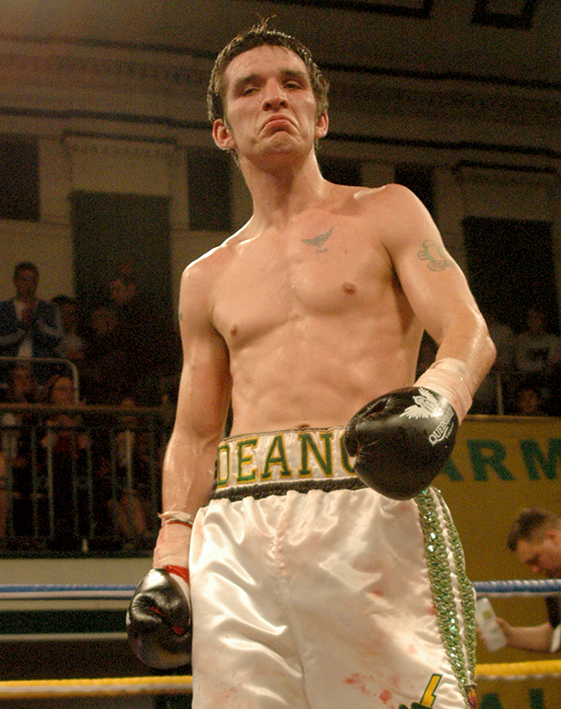 Globe trotting Byrne (pictured) started his pro career in Australia, where he won the New South Wales State Light Welter title on just his fourth outing, before going on to secure the Australian title, with a convincing points win over Chris McCullen, on his next fight. The chirpy Irishman successfully defended the Aussie crown, with an equally impressive points win over Brad Crookey, before setting sail in an attempt to conquer America. Linking up with none other than Freddie Roach, Byrne racked up an impressive 12-0 record before returning home to the Emerald Isles and adding two further impressive wins to his record, stopping Konstantins Sakara in four and a shut out points win over Sergejs Volodins. In 2011 Byrne crossed the Irish Sea intent on making his mark on the British scene. With a tidy points win over Michael Frontin on the 21st October, Byrne looked on target to conquer a fourth country. Promoter Frank Warren must have thought so also, as a few days later after Frankie Gavin pulled out of his fight against Frank Haroche Horta, the astute Mr. Warren offered Byrne the fight. So just one week later, on the 28th October, Byrne was back in action, however his willingness to fight on such short notice blew up in his face, as he retired at the end of the eighth round. Frank Warren showed his appreciation by offering Byrne the opportunity to fight on the historic April 2012 show, that heralded the return of professional boxing to the Royal Albert Hall, against unbeaten prospect Terry Holmes. Unfortunately for Byrne, after eight all action rounds referee Robert Williams gave the nod to Holmes by a close 77-75 points margin. It would be five months before Byrne would be back in action, but when he was he was clearly determined to get his career back on track, as he completely dominated Kevin McCauley to take a shut out points win. Byrne rounded out the year with a barnstorming battle with America’s Carson Jones, the chirpy Irishman seemed well in control of the proceedings and looked set to add another high profile scalp to his belt, however the man that counts, referee Ian John-Lewis see it differently, scoring the bout a draw. Which brings us nicely up to date and Byrne’s impending International Masters clash, against Jay Morris at York Hall in London on Saturday 27th April. Earlier Byrne spoke briefly about both the Carson Jones fight as well as the impending 27th April date with Morris, “Yeah, I’m really looking forward to getting back in the ring, it’s been a while, four months since my last performance against Carson Jones. That was a great fight, everyone tells me they thought I won it, I did too but can’t complain about the result, these things happen, I look at it as a draw is better than nothing. It’s true, I threw more punches than him, landed more than he did and I made him miss often. I made him pay in the last round, so really thought I was going to get the decision, but in this boxing game you never know until the verdict is read. Yeah, well so it goes, now I’m focusing on the 27th, Jay Morris is a hard battler, his record may not be the greatest but he always comes to fight. He’s already been the British Masters Champion so you know he can deliver. I’ll box clever, fight the way I did against Carson Jones but step the tempo up a bit more and make sure I get the decision. Dean ‘Irish Lightning’ Byrne versusJay ‘IOW Assassin’ MorrisInternational Masters Welterweight Championshipclash headlines Dave Murphy’s Thunderdrome Promotions ‘Thunder & Lightning’ event at York Hall, Bethnal Green in London on the 27th April 2013. Tickets, priced £65 (Ringside), £35 (Floor) and £30 (Balcony) are available on-line at www.tkoboxoffice.com and www.mariannemarston.com or in person at the TRAD TKO Boxing Gym in Canning Town, London E16 4SA - www.tkoboxinggym.com - or the Ringtone Gym in Euston, London NW1 2PB - www.ringtonehealthandfitness.com - Tel: 07960 850645 or 07557 641597 for further information.